Balance, modified or not, will be lost if the hind legs are not straight, i.e. if the hocks are turned in or out. Turned out hocks are the less common, they turn the feet in, 'Pigeon-toed'. Turned-in hocks, 'Cowhocks', are a well known and more prevalent fault. Lack of room forces the stifle out, which in turn forces in the hocks and splays out the feet. In cows this allows room for the udder but in dogs it is a fault as it seriously weakens drive. Drive is provided at an angle to the desired line of movement. When the dog moves away these faults and more may be revealed. Hocks 'well apart' refers to the fault of moving close (brushing hocks). This fault has to be distinguished from single-tracking, which is the natural tendency of most breeds as their speed increases. The reason and extent of this tendency are the same, front and back. 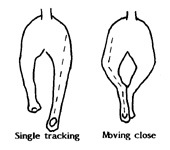 When a dog is 'moving close' behind, the hind pasterns brush past each other and may even touch. The stifles usually break the hip-foot line as well. Drive is lost as a result. The condition is often attributable to weak rearing muscles.